Breeding Cockroaches for your Reptiles Diet is not as difficult as you may think! Most cockroaches are oviparous, with the eggs being located outside of the mother’s body. This commonly referred to as “live bearing”. The eggs are carried in an egg sac (ootheca), which are attached to her abdomen. Often the eggs are hidden or dropped just before they hatch. Other species carry their eggs after they are born. Some species continue to carry the hatching eggs and care for their young after they are born. It is important that this egg sac remain moist otherwise the eggs will not develop properly. If low humidity conditions persist for long periods the productivity of the colony will reduce or stop breeding. Some species are ovoviviparous, with the ootheca located inside the mother’s body. Newly hatched roaches, are known as nymphs. When born their exoskeleton has not hardened and is white in color. At this stage they are prone to dehydration. Shortly after birth the exoskeleton hardens and they resemble small, wingless adult roaches. Nymphs undergo a number of molts before becoming adults. The period between each molt is known as an instar. 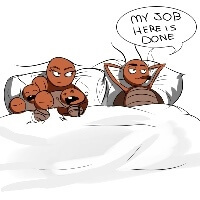 Each instar results in the cockroach becoming more adult like. Some species live for a few months, others live for more than 2 years.